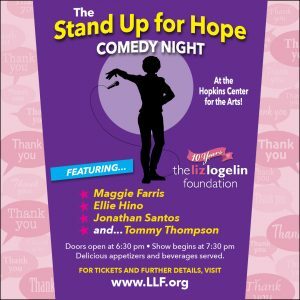 Stand Up For Hope to benefit the Liz Logelin Foundation returns with an epic night to celebrate our 10th year as a foundation! You’ll laugh. You’ll cry. Most importantly- you’ll be giving Hope to widows, widowers and their families. Stand up comedy featuring Maggie Farris. Ellie Hino. Jon Santos. Tommy Thompson. And of course we’ll have a ton of great food and fun games to play before the show starts! Over the past 10 years, hundreds of families have turned to The LLF for critical resources and support after the loss of a loved one. We, along with those we serve, would like to sincerely Thank our supporters from the bottom of our hearts. During some of the darkest times, you have been the Hope for many. You have helped families navigate their grief and let them know there is a community that supports and cares about them. You have made memorials of loved ones possible and sent children to camp. You have provided temporary financial relief- diapers, food, daycare, clothing and paid for sports and extracurricular activities. You have made an impact on the lives of many and we are forever grateful. Whether you’re a past supporter of The LLF or brand new to our community, we invite you to join us for an amazing night full of laughter and memories to bring Hope to many more families in need. Sponsorship opportunities are available for these events. If interested please send an e-mail to hello@thelizlogelinfoundation.org. Golf for a Cause…3, actually! 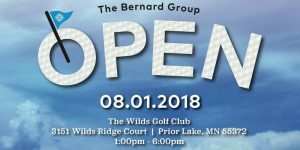 The TBG Open, hosted by The Bernard Group is coming back in August 2019! Stay tuned for details! Events are a big part of our public awareness campaign and fundraising efforts. The LLF conducts a number of events throughout the year. These events are great ways to meet others in similar situations and support your neighbors who are grieving. Events include 5K/10k races, gala events, benefit concerts, sports events, bowling outings, book signings, cross country bike rides and comedy shows. We encourage our friends and supporters to organize events locally and ask that you contact the LLF before you begin planning. Have questions? Send a note to inquiries@thelizlogelinfoundation.org and check out our Third Party Event Guidelines! Keep up to speed with all of our upcoming events by liking us on Facebook.